With the holiday season steamrolling over all our very recently turkey-stuffed bodies, it’s officially time to jump back into something that’s just as polarizing as it is unstoppable. No, I’m not talking about fruitcake (yuck), or Christmas music (mostly also yuck). I’m, of course, referring to the bizarre and melancholy meta world that is Netflix’s Neo Yokio. It’s been a hot minute since we were treated to a glimpse into the world of socialite Kaz Kaan, and even though the show certainly left an impression on pretty much everyone who even heard about it, there’s a hefty chance that some elements have dropped out of mind in the year plus that we’ve gone without new content. Luckily, the wait for a fashion-forward update is practically over with Pink Christmas dropping tomorrow, but we here at PCU feel it couldn’t hurt for a refresher course (or a cheat sheet if you’re new) of what you, dear viewer, are about to dive back into. Spoilers ahead, for the culture! Kaz Kaan (Jaden Smith) is an exorcist. 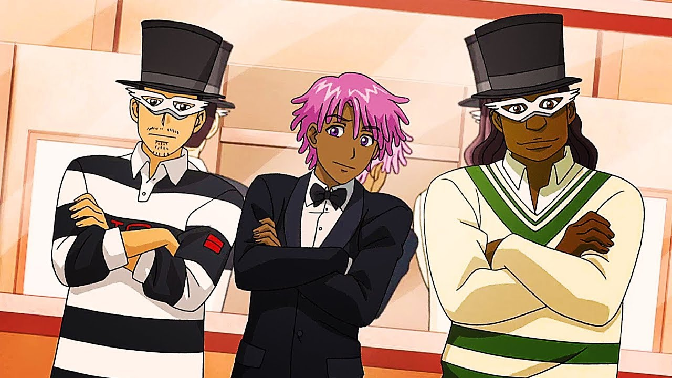 This kind of got lost in the plot about halfway through the season in favor of, I kid you not, a crime thriller, communist espionage story-line, but the show’s initial premise was that it’s protagonist was as handy at trouncing demon’s as he was dressing to impress for the city of Neo Yokio’s plethora of high society-events. Though Kaz often seems bored and put upon by the very notion of having to battle the unholy, he manage to foil at least three supernatural baddies all on his own before Yokio’s first season was through. No word on whether or not the Christmas special will focus more on this particular set of skills, or simply Kaz’s continued war with existentialist angst and bachelor rankings, but since he’s also apparently the heir to a lineage of the demonic version of Van Hellsing, it’ll most likely at least get mentioned, even if it’s only in passing ennui. Because it’s anime, Neo Yokio keeps a giant scoreboard of its most eligible bachelors at the city’s center, one where Kaz is almost perpetually ranked number two. Surprisingly, the board itself did segue into some interesting and, what come to be typical, talking points about one’s place in society, enough so that it was blown up as an act of defiance in the face of Neo Yokio’s nouveau riche. That said, trailer’s for the Christmas special seem to indicate that the board has been restored, so it will likely continue tormenting our hero and acting as an enormous set piece to be mined for explorations of societal values, though I’m mostly banking on the first part. Early on in the show, Kaz’s two best friends decide that they need to make a classic drink to really put them (their bar?) Let’s be honest, I’m not really sure what they did), on the map. Enter the Caprese, a martini comprised of vodka, tomatoes, and basil, with a mozzarella garnish, and its own tagline. Sound good? No? Well, either you have functioning taste buds, or just aren’t getting Caprese like you ought to. I personally vote for the former. If you recognize a voice coming out of one of series’ many colorful characters, it’s likely because Yokio recruited all manner of actors and voiceover veterans to fill out its cast. Aside from the previously mentioned Jude Law, there’s Susan Sarandon as Kaz’s no nonsense Aunt Agatha, comedy icons Desus and Kid Mero as his friends Lexy and Gottlieb, Jason Schwartzman as Kaz’s uber-slick rival turned frenemy Arcangelo, and voice actor extraordinaire John DiMaggio (amongst many other things, Jake the Dog and Bender, yo). There was even a blink (or whatever the hearing equivalent is) and you’ll miss it appearance by Smith’s equally talented sister, Willow, as a cultist bent on sacrificing Kaz to the dark powers of idol worship. Neo Yokio is filled with all manner of madness (see basically everything else on this list), but each bit of anime-styled anarchy is infused with self-referential, meta commentary, that seems to suggest that it’s winking at you the entire time. That said, the show never strays all the way into parody, taking its ludicrous plots seriously enough that one can’t help but wonder if sometimes it really means all of it, no joke. I mean, obviously, it can’t… But what if it did? Yeah, my head hurts too. Look, I’m going to put the clip here, but if you did happen to forget this, or somehow never knew about it in the first place, then you really don’t deserve this big Toblerone. Reeling from this trip down memory lane? Upset that I forgot something monumental? Confused as all get out? Sound off in the comments and tell me how you really feel, and please, please, don’t forget to have a Merry Pink Christmas, and Get Caprese— actually, no. Please, do not make or drink that drink. Trust me. Neo Yokio: Pink Christmas premieres December 7th on Netflix.